Rupert Shephard (1909-1992) studied at the Slade School of Art from 1926 until 1929. On leaving the Slade, Shephard became a schoolmaster using his evenings to paint. 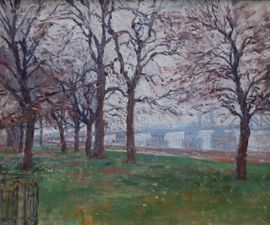 He had exhibited his paintings since 1929 at various London venues. In 1937, the inaugural year of the Euston Road School of Drawing and Painting, he exhibited with the school's founder members William Coldstream, Claude Rogers, and Victor Pasmore at the Storran Gallery. During the Second World War he worked as an official war artist. He subsequently moved to South Africa with his family to become the director of the Michaelis Art School at the University of Cape Town. He returned to England in 1962 and painted full-time from then on.